I’m Shona, studying history so very much at home with the books! When I’m not in the library my passion is drama: whilst at uni I’ve been involved in 14 theatre productions and counting, including a Shakespeare tour to America. 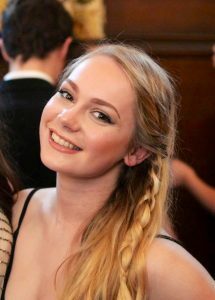 I’m also a member of Durham University Dance Troupe, and have dabbled in cheerleading (captain of the Castle 2015/16 squad), yoga, aerobics, acapella, CCA and SCA, ents, the June Ball Committee and Toastie Bar. In my spare time – if I have any – I love Christmas, I love my friends, and most of all I love wine. The Lowe Librarian is responsible for the day to day running of the College’s Lowe Memorial Library during term time and serve as a point for the JCR.